Brings jQuery tabs into RapidWeaver. Is there a better alternative to cleanTabs RapidWeaver Stack? 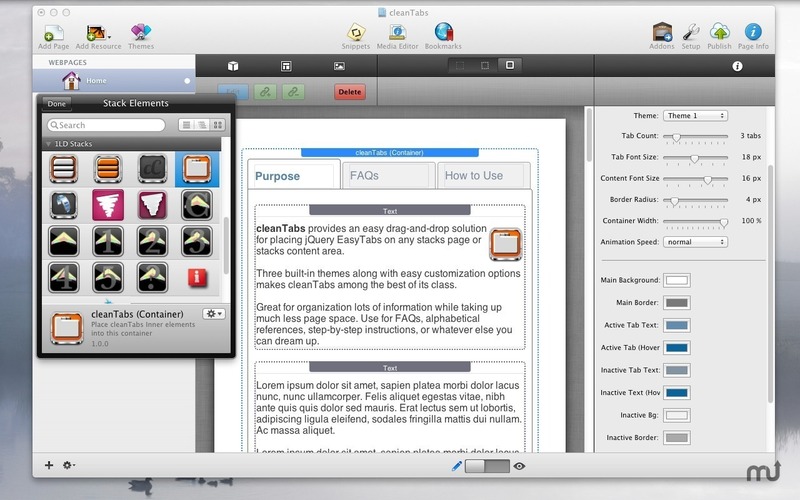 Is cleanTabs RapidWeaver Stack really the best app in HTML category? Will cleanTabs RapidWeaver Stack work good on macOS 10.13.4? cleanTabs RapidWeaver Stack brings the EasyTabs jQuery Tab organizer into RapidWeaver offering super fast load speed, easy customization, and a sleek simple design perfect for organization. The minimalistic design approach is perfect for saving space on any page or sidebar section and offers 3 built-in themes allowing a fit for just about any theme on the market. It's pretty easy to use, but if you ever get stuck our support can help you resolve the issue. cleanTabs RapidWeaver Stack needs a review. Be the first to review this app and get the discussion started! cleanTabs RapidWeaver Stack needs a rating. Be the first to rate this app and get the discussion started!